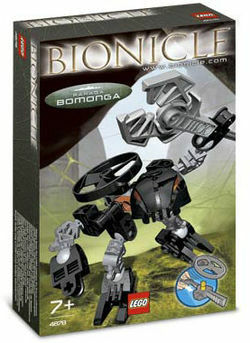 4878 Rahaga Bomonga is a BIONICLE set released in 2005. It comes with a black Rhotuka Spinner, a Rhotuka Launcher, Bomonga himself, and his staff. He was one of the six Rahaga released. He was originally one of the the Toa Hagah, but a set of his Toa form was never released. This is a description taken from LEGO.com. Please do not modify it. (see an archive of the product's page) Nothing can hide from Bomonga! Rahaga Bomonga's spinners fly silently through the air, striking his prey and holding it motionless. Extremely patient and skilled, Bomonga will wait for hours to catch one Rahi. Add #4877 and #4879 to build a Visorak colony drone! His head and weapon are the same as those of the Rahkshi Vorahk. Facts about "4878 Rahaga Bomonga"
Nothing can hide from Bomonga! This page was last edited on 1 May 2016, at 16:05.